After suffering damage as a result of a gear up landing in 1998, and discovering structural corrosion, it was going to be a slow recovery for P-51D Mustang s/n 44-73990. Many wondered if it would ever fly again, but Mark and Alan Henley always knew it would grace the skies once more. Seventeen years later, it did just that. 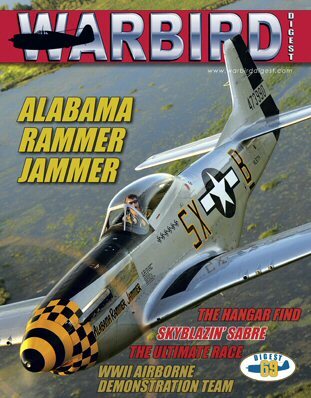 This is the story of their journey, the passing of the torch to the next generation, and the World War II pilot it honors as the “new” ALABAMA RAMMER JAMMER. When it comes to eye-grabbing paint schemes, the F-86 owned by the Righetti family and operated by Doug Matthews’ Classic Fighters, is the pinnacle of cool. This flashy jet wears the markings of a little known USAF flight demonstration team, the Skyblazers, which performed in Sabres during the 1950s. When the men and women of the Airborne Demonstration Team don their uniforms and gather for a reenactment, they take center stage to capture the imagination of spectators and stir the memories of veterans. At their home base at the old Frederick Army Airfield in Frederick, Oklahoma, they operate from the last remnant of the base’s proud Airborne heritage, and jump from their combat veteran C-47s, to hone their skills and preserve U.S. Army Airborne history. Alain Battisti, a French aviation businessman, warbird owner and pilot, was considering a Corvette for his means of transportation for his visits to the United States; however, good friend Olivier Langeard suggested he get something much faster, and much more fun—a warbird! When they opened the hangar to inspect this dormant early model T-28A Trojan, their hearts raced. How did this Trojan stay so untouched, and what would it take to get it flying again?